Cassini–Huygens is a spacecraft that was sent to study the planet Saturn, its rings, and its moons. It is a mission made by NASA, the European Space Agency (ESA), and Italian Space Agency (ASI). 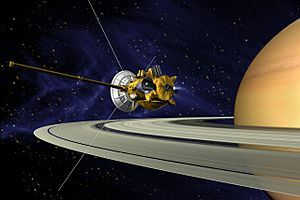 The spacecraft has two main parts: the Cassini orbiter and the Huygens probe. It was launched on October 15, 1997 and entered into orbit around Saturn on July 1, 2004. It is the first spacecraft to orbit Saturn and the fourth one to visit Saturn (the others were fly-by's and did not enter orbit). The mission has been extended until 2017. The orbiter is named after the Italian-French astronomer Giovanni Domenico Cassini, who discovered some moons of Saturn. Most of the orbiter was designed and built by NASA, although ASI built and programmed some parts that talked to the Huygens probe. The spacecraft is still in operation, sending back data. ESA (European Space Agency) made the Huygens probe, named after the Dutch astronomer, mathematician, and physicist Christiaan Huygens who discovered Titan. On December 25 2004, the Huygens probe left the orbiter. A couple weeks later, the probe parachuted onto Saturn's largest moon Titan. Astronomers have wondered what the surface of Titan was like, since it was hidden under thick clouds. It is the only moon in our solar system with a thick atmosphere. The probe descended and sent pictures and other data back for scientists to study. After 90 minutes on the moon, the spacecraft stopped working, as expected. It is the farthest place we have ever landed a spacecraft. The pictures sent while parachuting showed that there were rivers, probably of liquid methane. It is much too cold for water. Cassini−Huygens Facts for Kids. Kiddle Encyclopedia.